We have selected and combined the best software and best-practices in the world, to offer you a unique innovation solution. Stage-Gate International is the world’s leading provider of services to enable organizations to improve their Product Innovation and Portfolio Management capabilities. A globally recognized and trusted brand, Stage-Gate International accelerates client success with strategic advisory and transformation services, leading-edge products, best-selling publications, first-rate seminars and Stage-Gate® Certification. Clients include more than 5000 organizations of all sizes across all industries. Learn more at www.stage-gate.com. – Dr. Robert G. Cooper, world’s most influential innovation thought leader and author of best-selling book, Winning at New Products, as well as six other highly acclaimed books. 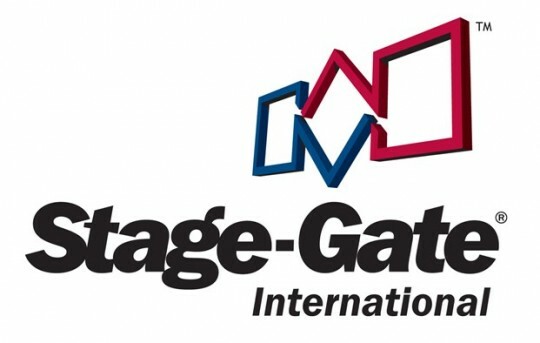 Stage-Gate® is a registered trade-mark of the Product Development Institute Inc.
nu Angle is the leading technology strategy and roadmapping advisor and implementer. Combining these approaches with highly experienced teams help executives deliver on growth goals by greatly improving effectiveness and efficiency of investment in internal and external technology. Building upon previous best practice technology management tools, nu Angle has created a suite of truly powerful decision-making tools in technology strategy and roadmapping that help plan approaches for growth, create new insights and manage capabilities. nu Angle is a network of highly experienced advisers and innovation integrators that are committed to working directly with client teams, bringing experience, wisdom and knowledge to every client assignment. Based in Cambridge and London in the UK, nu Angle operates throughout Europe and America. Learn more at www.nu-angle.com. “Over the last 5 years, we have helped CTOs and innovation teams make the right investment decisions by applying our state-of-the-art Technology Strategy and Roadmapping methodology. To support our customers, we have invested heavily in codifying our approach in a bespoke Microsoft Excel application, but with IFT we have now a more scalable solution that better support our collaborative multi-user implementations for our clients”. – Peter Allen, nu-Angle Managing Director. Blue Ocean innovation is the first Latin American consulting firm dedicated to establishing the ability in companies to innovate in a systematic and efficient way. We help companies achieve their growth and profitability objectives by simplifying innovation and making it predictable. We provide a comprehensive service which includes training courses, creativity workshops and implementation of automated innovation processes supported by software tools. Learn more at www.blueocean-innovation.com. Ennovative is a consulting firm and systems integrator based in Mexico. Its mission is to add value to its clients’ operations by helping them to develop sustainable competitive advantage, by leveraging its proven experience in best practices of world class IT solutions with a strong focus on better efficiency and operating controls. Learn more at www.ennovative.com.mx. – Raùl Rhon – Director General – Ennovative Solutions. Innovation 360 works with companies and government entities throughout the Middle East to bridge the gap between business strategy and execution by employing systematic innovation and leadership development. Our world class trainers, consultants and partners have extensive experience working in a wide array of industries including financial services, insurance, healthcare, tourism, manufacturing, oil and gas, utilities and construction. Our technology partners like IFT provide software enablers to help you design your strategy, and drive your innovation and excellence programs. Together, we help organizations define and reach their goals. Learn more at www.i360institute.com. – Kamal Hassan, President and CEO of Innovation 360 Institute. Planisware is a global provider of Project Portfolio Management software designed for product development and R&D organizations. Today, 40% of the top 60 R&D spenders worldwide utilize Planisware solutions at a corporate level to manage their projects, resources, and portfolios. Planisware is rated as the leading software platform for New Product Development by industry analysts including Forrester, Gartner, Info-Tech and IDC. Learn more at www.planisware.com. – Pierre Demonsant, Founder and CEO of Planisware. Qmarkets is the leading provider of collective intelligence solutions for enterprises from a wide range of business sectors. With offices in the US, Europe & Australia and with the R&D center in Israel, Qmarkets is the principal provider of idea management software with a true global footprint. In addition to idea management software, Qmarkets offers a wide range of collective intelligence solutions, including crowd voting, collaborative process improvement, market research, prediction markets, disruptive innovation engine and live workshop software. Its suite of solutions enable organizations to collaborate with their stakeholders, while running an effective and efficient process. Qmarkets is rated the leading idea management software by Info-Tech Group. Learn more at www.qmarkets.net. – Noam Danon, Founder and CEO of Qmarkets. Big Idea Group, Inc., uses open source networks to help corporations identify innovation opportunities, generate new products and services, and guide innovations through development. Our expertise is in delivering actionable consumer insights and successful innovations, based on years of experience in bringing both client and our own products to market. BIG has worked with a variety of clients in consumer product goods, from food and beverage to cosmetics, electronics, office supply, business services, medical, communications, entertainment, apparel, and more. BIG is partially owned by WPP, one of the world’s largest communication service groups. Learn more at www.bigideagroup.net. – Michael Collins – Big Idea Group CEO and author of “The Million-Dollar Idea in Everyone: Easy New Ways to Make Money from Your Interests, Insights, and Inventions“.